The Prometheus System - Intuitive Multi-Filament 3D Printing! DisTech Automation has developed a new solution for multi-filament 3D printing called The Prometheus System which allows you to print 2 different filaments from a single nozzle. It works by pulling one filament out of the hot end and feeding another filament into the same hot end to switch between filaments. This new product builds off of our existing Prometheus V2 Hot End. Using a combination of custom filament switching G-code, precision machined parts, the 1-piece internally polished Prometheus V2 nozzle, and powerful geared extruder stepper motors, we are able to reliably print objects with hundreds of filament switches in a single print! This enables you to print multi-color objects, print with support material, or create multi-material prints! Multi-Color Worlds printed in ABS plastic. Propellers: Yellow PLA with PolySupport support material on the left; Nylon Alloy 910 with Guidel!ne PETG support material on the right. Composite wrench printed with Colorfabb XT-CF20 Carbon Fiber perimeters and Colorfabb XT Clear infill. The objective with this new product is to eliminate the difficulties and quality issues associated with conventional methods of dual extrusion (calibration, nozzle dripping, color contamination, extrusion pressure, etc...). I am really excited to hear what you all think of this new product! We have been working hard to find the optimal solution for multi-filament 3D printing and we think this is it! Please use this thread to share your thoughts on our new product and our unique approach. We are committed to working with the open source community and we will be releasing this product under the CC BY-NC-SA 3.0 Creative Commons license. Our Kickstarter campaign for The Prometheus System will launch on September 6th. You can sign up at [distechinnovations.com] to receive a Kickstarter launch notification and get the first pick of the discounted Early Bird rewards. **Intuitive MULTI-FILAMENT 3D Printing** -- Successfully Funded on Kickstarter! 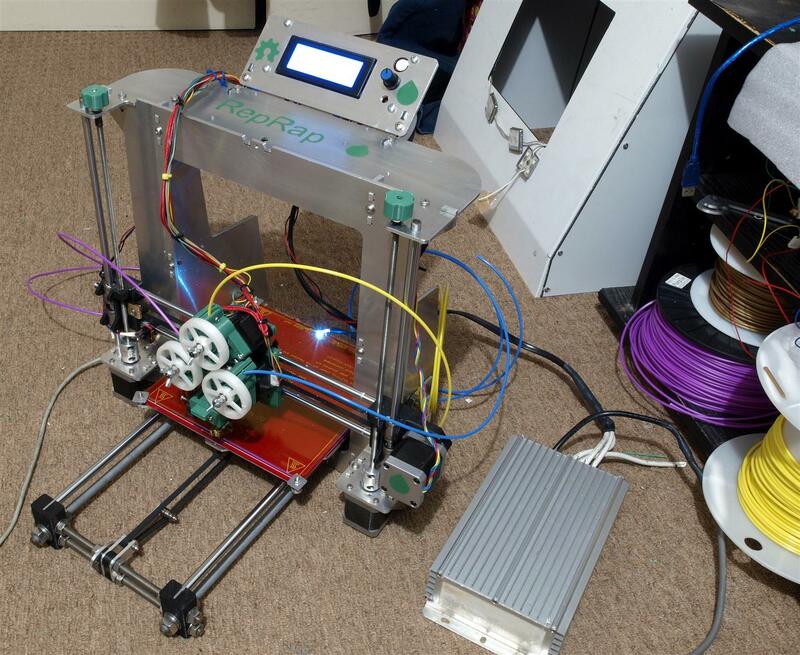 Re: The Prometheus System - Intuitive Multi-Filament 3D Printing! Looks nice! Could you also post some close-ups of those prints? Sounds great, I liked the look of your prometheus hot end but put off by lack of UK distributors. One thing I can say though, Please use less GIF's and more details and pictures of the internals of the extruder. The GIF's are very distracting, and make it annoying to read the post. RifRaf was doing this with 3 extruders back in 2014..
Edited 2 time(s). Last edit at 09/05/2016 08:36AM by Dust. Here are some up close pics. It was difficult to keep them in focus since I zoomed in so close. I am sorry that you find the GIFs distracting! I was using them to showcase the different type of objects you can create. I'll try to explain the system a bit more with detailed pics. The customizable design of the Prometheus V2 hot end allows you to configure the length of the “melt-zone” to your specific needs. Using a short 12mm “melt-zone” increases precision and minimizes filament waste with multi-filament 3D printing. The extruders are a very important part of the system and are required for it to work reliably. The extruders have a 5:1 gear ratio so that they can reliably execute the rapid movements required for filament switching. In addition, they are designed to effectively guide the filament in and out of the extruders for long retractions of about 150mm for filament switching since they have bowden inserts on the top and bottom. Finally, the drive gear is very sharp and does not have a concave so it does not eat away at the filament with rapid movements like some hobbed gears do. The ProFeeder directs the filament path from the 2 extruders into a single filament guide that feeds into the hot end.The precision machined KETRON HPV – Bearing Grade PEEK Guide that connects the feeder to the hot end is the secret sauce of the Prometheus System. It reshapes the filament tip with each retraction so that it can be reinserted into the hot end without getting stuck. People have indeed been trying to do this method of filament switching for a long time. The reason it has never caught on is because nobody could get it working consistently enough to make it a viable product. That is the problem we are trying to tackle with The Prometheus System! Was playing with a similar idea myself, but the version I had in mind would cut the filament as it changed over, how does your system negate the need for that? Does it have a large retraction on every change over. Edited 1 time(s). Last edit at 09/05/2016 03:15PM by MechaBits. The Prometheus System does have a large (~150mm) retraction on each filament switch. It uses 5:1 geared steppers though so it can pull the filament in and out quickly. We also use custom G-code and machined parts to minimize stringing and reshape the plug that forms at the filament tip to ensure reliable filament switching. Here are some recent news articles about The Prometheus System! Though I designed the above before ever changing a roll, and the cut wouldnt have been in the ideal place, so bravo for realizing it could be done without cutting, some funky results there. Edited 1 time(s). Last edit at 09/06/2016 01:11AM by MechaBits. We just launched our Kickstarter campaign for The Prometheus System! We would really appreciate your support! Any issues with kinked Filament in the Pro Feeder? As it is two in and one out i expect you will have an area where the filamemts are not fully guided on each side. Do you have tests done with more brittle Filaments like wood or metal filled ones?? Also, i guess it is not possible to print flexible Material because of this. Edited 1 time(s). Last edit at 09/26/2016 06:36AM by Starscream83. No issues with kinked filament in the ProFeeder. There is only a small section where the filament is unconstrained. I have printed semiflexible materials like TAULMAN PCTPE (Flexible Nylon) without issues. However, I would not recommend printing super flexible filaments like Ninjaflex. As for brittle materials, I have not had issues with material breaking. The radius is a very gentle curve so it does not put extra stress on the filament as it passes into the ProFeeder. It’s been a while since the last update. We have been working hard over the past few months since fulfilling the remaining Kickstarter rewards in March, and we have some exciting news! We are proud to announce the release of the Prometheus System (E3D V6 Upgrade)! 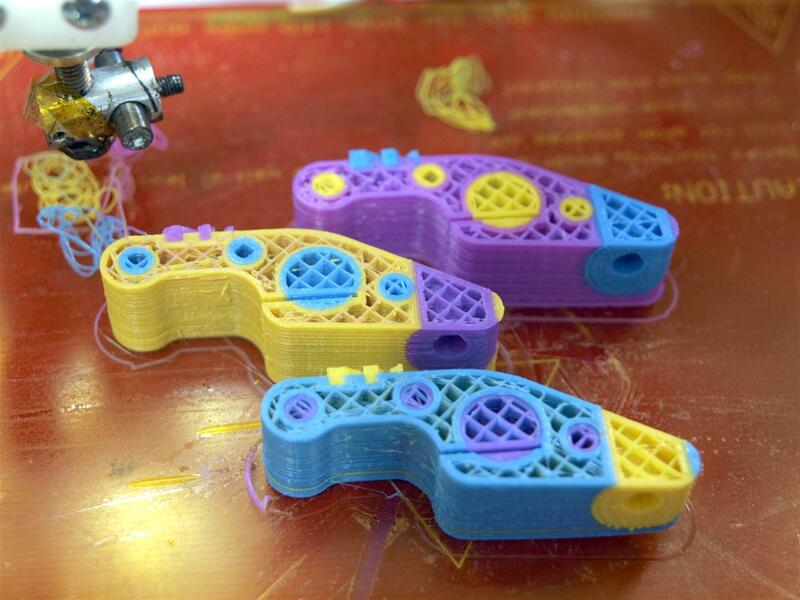 This upgrade kit allows E3D V6 Hot End users to create multi-color and multi-material objects. The Prometheus System solution simplifies the multi-extrusion process and expands the capabilities of 3D printers using the E3D V6. 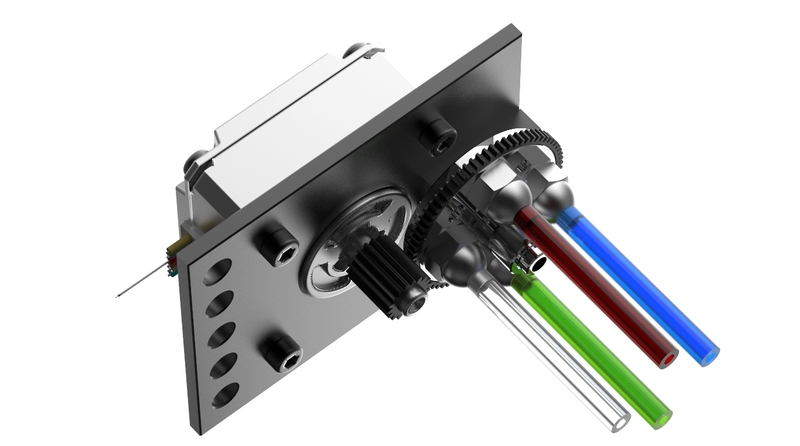 The original Prometheus System was specifically designed to work with our Prometheus V2 Hot End. However, with the success of the Kickstarter campaign and hundreds of active users around the world, many people have requested system compatibility with the E3D V6 Hot End. To enable reliable multi-filament 3D printing using the Prometheus System with the E3D V6, we had to develop the "Prometheus Heat Break". This is a precision machined and polished component that replaces the standard E3D V6 heat break to facilitate reliable filament switching with the Prometheus System. The Prometheus System (E3D V6 Upgrade) solves all of the issues associated with conventional methods of dual extrusion. We believe that this new product will be a popular upgrade for E3D V6 users who want to print multi-color and multi-material objects. In addition to the release of the E3D V6 Upgrade kit, we wanted to provide a quick update on Simplify3D software compatibility with the Prometheus System. This is something that many people have been asking about, and unfortunately, it has been delayed for a long time due to ongoing bugs in the Simplify3D software. However, one of our Kickstarter backers named Pekka, (aka. “spegelius” on our forum) recently began working on a post-processing script called “FilaSwitch” to allow Simplify3D to work with the Prometheus System. We are supporting his efforts and he has made a lot of progress! You can view his development thread on our forum by clicking on the link below. Feel free to post in that thread to offer him encouragement or suggestions for his script. We will be sure to post an update as soon as the S3D post-processing script is ready for beta-testing It’s almost ready! After a few weeks of beta testing, the Prometheus System is now officially compatible with Simplify3D! FilaSwitch is a Python script that processes the S3D G-code output and adds a smart purge tower to enable compatibility with the Prometheus System. This smart purge tower has some very neat features to optimize the filament switching process. As seen in the preview below, FilaSwitch eliminates unnecessary filament switches on single color layers by printing a support structure on the tower. This saves a lot of time and filament. FilaSwitch also generates a perimeter around the tower to keep the purge lines clean and contained and stops printing the purge tower when there are no more filament switches required for the print. FilaSwitch ... stops printing the purge tower when there are no more filament switches required for the print. Uh, the photos of the Benchy don't appear to show that... the purge tower appears to be almost the same height as the boat, including the top part of the chimney which is all blue. ??? It's hard to tell, but for the last few solid blue layer, there is actually no filament switch. This feature is more apparent with models with a solid color for the last several layers. Keep in mind that the dual color Benchy model has both blue and brown colors right up to the last few layers. We are offering a 15% discount on all orders during this Black Friday weekend! Sale ends Monday, November 27! We are having a Christmas Sale at DisTech! We are offering a 15% discount on all orders placed through our online store! Sale ends Wednesday, December 20. Our Christmas Sale is the perfect time to buy a Prometheus System or Prometheus V2 for your printer in time for the new year! Merry Christmas and happy printing!